Everything I knew about Lebanese food before going to Lebanon, I learned from my mother. As far as I could tell, cooking Lebanese dishes involved large glugs of olive oil, the death of whole families of lemons, a generous helping of garlic, plenty of parsley, a few dashes of cumin and some sumac for good measure – once it became possible to buy sumac in the backwaters of London, that is. On our visit to Lebanon in April, we came across many of the dishes I grew up with and stuffed our faces with them on more than one occasion. These are the ones that are likely familiar to anyone who’s been to any mediterannean/levantine restaurant or country and you probably don’t need me to tell you about the tastiness of hummous, baba ganoush, tabbouleh, fattoush, grilled meats, kaftas, kebbehs, olives, turnip pickles, stuffed vine leaves or all the other things I really want on a plate with some freshly warmed pitta bread right about now. Many of my other childhood favourites, however, were nowhere to be found in the restaurants we visited. That is perhaps not unusual considering they are more family-based recipes, moulded by multiple migrations through Europe and the Arab world. 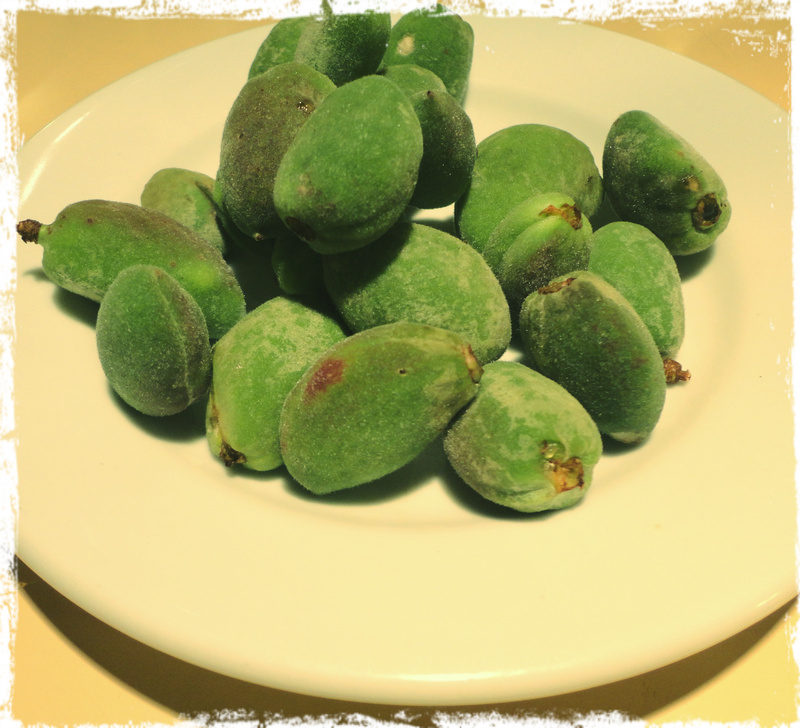 These fuzzy green almonds were in season during our visit and restaurants often offered us a free plate of them with dessert. A great palate cleanser, the taste is slightly bitter but tangy and strangely addictive. You can eat them whole, including the part that, when hardened, would normally be the outer shell that you would have to crack to get to the nut inside. The immature nut is, at this stage, a soft pod with a really fun texture, sort of like a crunchy grape. While this dish can’t be claimed solely for Lebanon, it was one of the most delicious things we ate while there. Sadly it’s basically impossible to take a photo of moloukieh that makes it look even slightly appetising, so you’ll have to take my word for it! It even sounds rather disgusting. A green, gloopy stew made from mallow leaves (from the plant that jute is spun from) and chicken, it is served over rice and garnished with raw onion and vinegar. Thankfully it smells and tastes delicious so if anybody ever offers to cook this for you, say yes.. you won’t regret it! We knew all about Lebanese wine but what we weren’t expecting was a growing beer culture. Almaza seems to be the leading brand and produces the pils pictured below that we dubbed the “Bud of Lebanon” because of its pervasiveness. 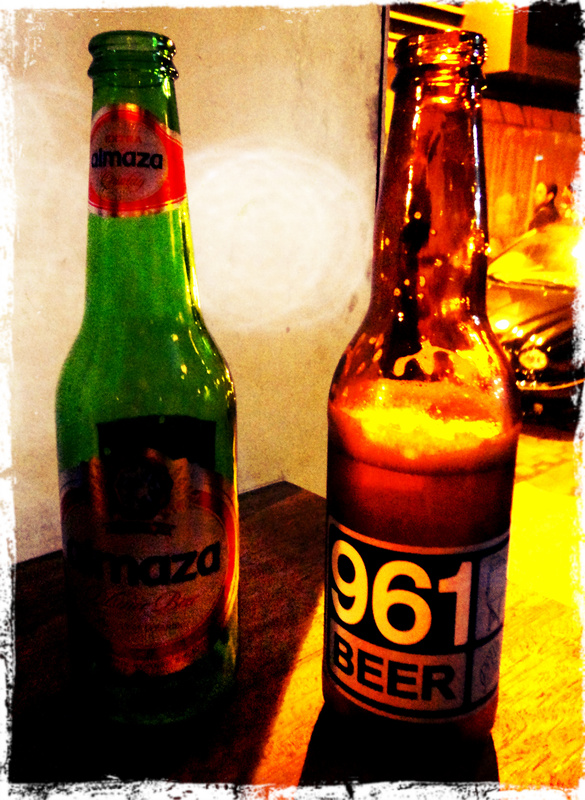 In the distant past, beer and wine were made throughout the region but production declined during the Islamic period. During the French mandate, wine was reintroduced and quickly gained acceptance but beer has been slow to follow. Lebanese beer advocates are now trying to bring the practice back to Lebanon and back to using Lebanese ingredients. One success story is 961, named after the telephone code for Lebanon. It started life as the first microbrewery in the Arab world but swiftly acquired a large following and now produces millions of bottles its beers – wheat, red ale, pale ale, lager and stout – every year. 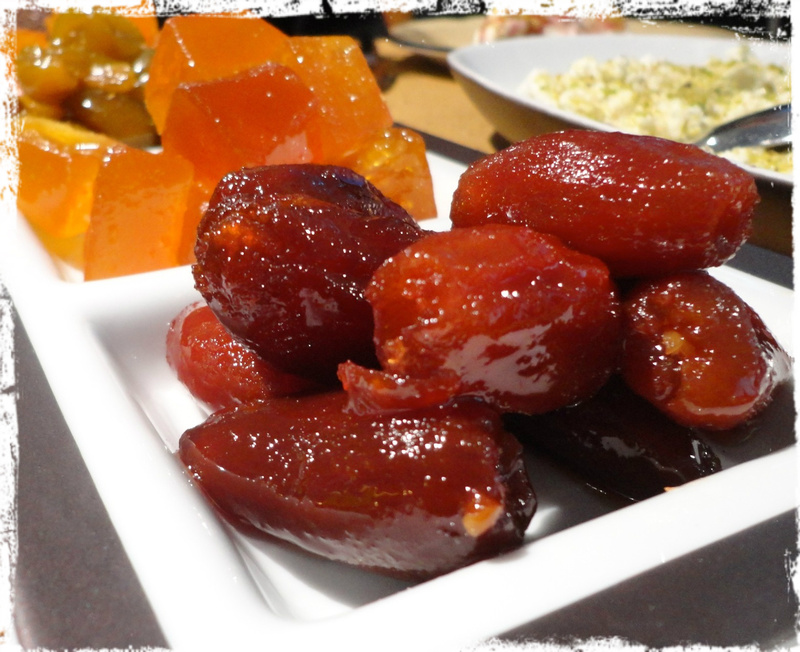 For a non-alcoholic alternative on a warm day, try a jallab – a drink made from a syrup of grape, dates and rose. It is served over crushed ice and topped with pine nuts. 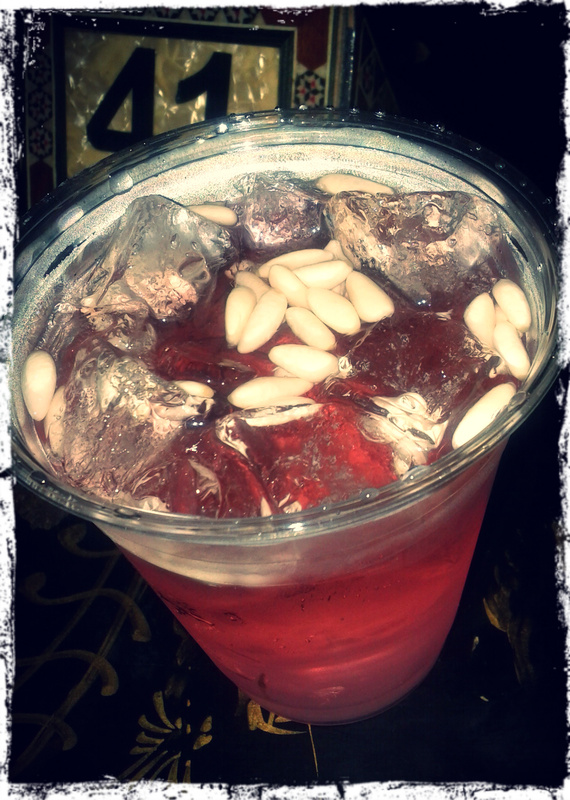 Sweet but refreshing, it tastes a little like liquid turkish delight. On a trip into the mountains near Beirut, Stacker’s cousin took us to a bakery with an ice cream stand outside. We each bought a tub of pistachio and rose flavoured ice creams and then we drove to a lookout spot by an abandoned monastery to savour it while watching the sun drop behind the mountains all around. On dipping a spoon in it, it became clear that this was no ordinary ice cream. It was sort of tacky and could be pulled out into long strands from the tub to my spoon. The reason for the putty-like texture is the addition of an unusual ingredient called mastic, the resin that weeps from the branches of the Pistacia lentiscus tree. As well as gooing up the ice cream, the mastic also imparts a subtle and unique mouth-cleansing flavour. In my book, the only thing more fun than a tasty dessert is a tasty dessert you can play with! Mastic is not the only dessert made from unusual plant products. At the same bakery, we picked up some karabij – soft cookies filled with a sweet pistachio paste – accompanied by a gloopy white dip called natef to dunk them in. 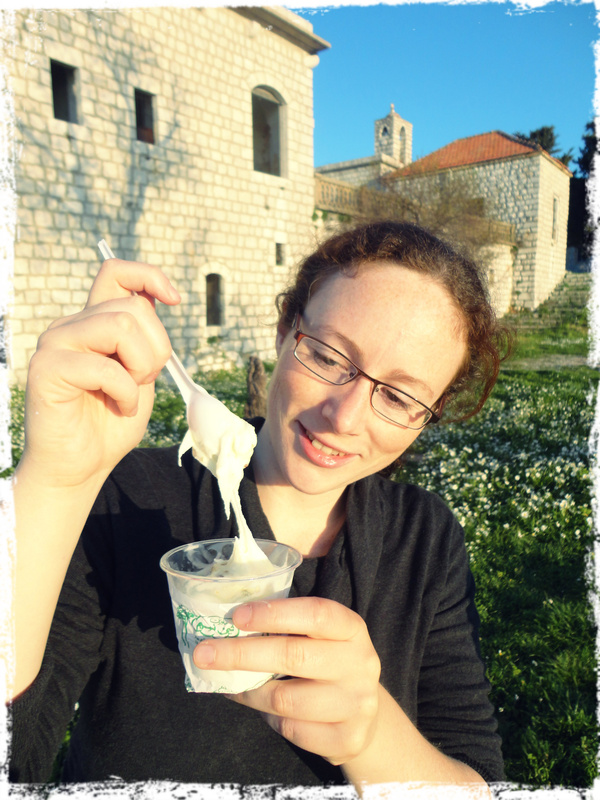 The dip has the consistency of melted marshmallow and is flavoured with rose and orange blossom waters. To make natef, the woody roots of soapwort (also known as Panama bark) are boiled and whisked until the saponin compounds within them produce a white foam. It is then mixed with sugar syrup to form the glossy and fluffy final product. Barking mad? Maybe. Delicious? Absolutely! It sounds ridiculous, but fish wasn’t really on my radar as typical Lebanese food. Of course, with the majority of Lebanon’s cities being situated on the Mediterranean coastline, fish features heavily in menus across the country, even if consumption doesn’t quite rival that of more traditional meat dishes. Many restaurants have a fresh fish counter where the offerings vary by the season and you can choose your fish – sardines, anchovies, red mullet, shrimp, bass and sole are just some examples – as well as what should happen to it before it arrives at your table. Typical Lebanese fish dishes involve either simply grilling the fish, making them into koftas (fish balls) or into a spiced rice, fish and onion concoction called sayadieh. In general though it seemed one of the most popular preparations in restaurants was to coat the fish in a spiced flour mixture and deep fry them. 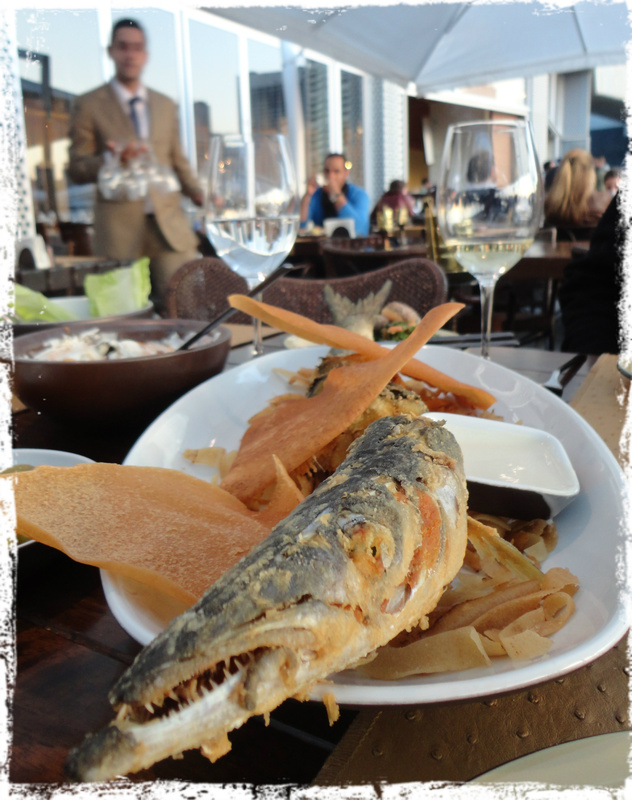 Fish cooked in this manner are generally served with a lemon and tahini dipping sauce called tarator and are eaten whole – bones, faces, fins and all. This seemed straightforward for the small fish like anchovies, which we were used to eating under the guise of ‘pescado frito’ in Spanish restaurants, but the red mullet and other larger fish were often prepared in the same fashion, although the insides are cleaned out beforehand. As I crunched into them, I could almost feel the calcium from the bones absorbing itself into my body, compensating – in my mind – for the sin of eating deep fried food. Mannakish is a soft round bread made from a pizza-like dough that is traditionally topped with olive oil and za’atar – a mixture that varies by country but usually consists of dried thyme, sesame and sumac. Growing up we used to make a simpler version of mannakish by spreading za’atar on pitta bread and toasting it. Nothing compares, however, to eating them fresh from a furun (stone oven) or from a street vendor who cooks them over a hot metal dome. These days they coming to resemble pizzas more and more as the addition of mozzarella-like cheese is now a popular addition. Or, if you order a ‘cocktail’, they’ll often dispense with the za’atar and add tomato paste instead. 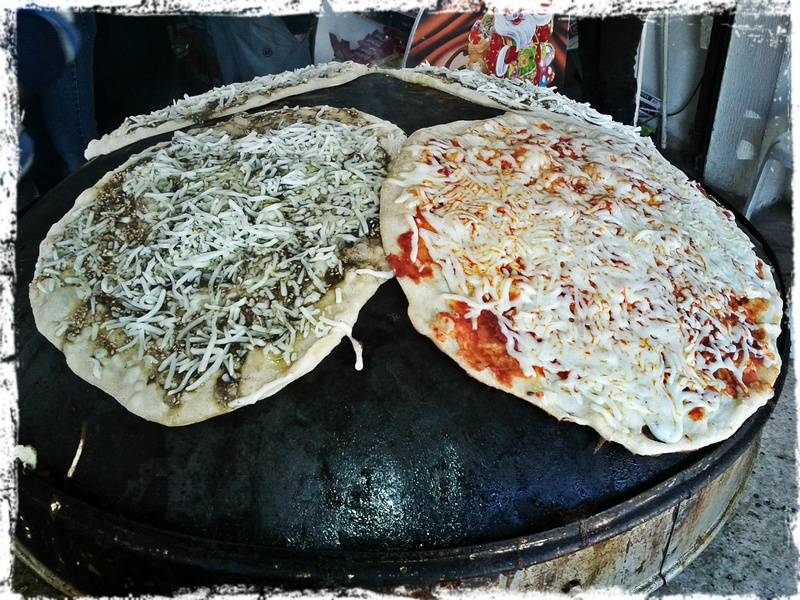 Rolled up with some salad and olives inside, it’s Lebanon’s answer to the perfect street food. 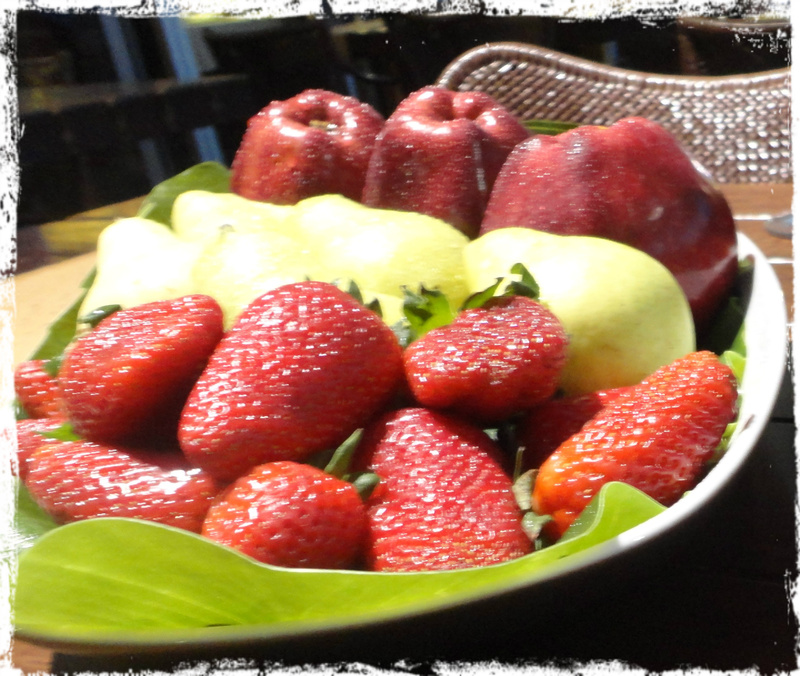 In many restaurants it’s considered a courtesy to offer guests complimentary fruit after a meal. These offerings vary from a plate of to a basket to a full-on platter of whatever is in season – berries, apples, pears, oranges, melons, kumquats, almonds, plums – and even, in some cases, dried or candied fruit as in the picture at the top of this post, taken at Babel in Zaitounay Bay. ← Erm, Stacker, I’ve, ahh, done a really bad thing….